I made this purse for my sister-in-law Liz's birthday in January. We don't exchange gifts on a regular basis, but I felt the need to make her this bag this year. She playfully asked me a few weeks earlier when she was getting HER purse, and I thought I'd take her up on it. 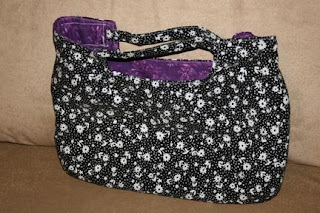 It's the second or third "charming handbag" (the name of the pattern) that I made from the book Bend The Rules Sewing by Amy Karol. I love that pattern! I like the contrast of a simple outside fabric and a vibrant fabric on the inside. The color choices were easy: Liz's favorite color is fuchsia, and she uses black and white prints as accents in her craft room. I bought the fabrics as fat quarters at JoAnns, and I don't know any more about them than that (JoAnns doesn't label their fat quarters - maybe it's an in-house design?). I wish I'd added a fuchsia ribbon to the outside front like the pattern suggests, but I didn't think about it until just now. I also think the choice to use white thread for the top-stitching is unfortunate, but I'm not sure what I would have done differently. This is one of the last photos I took of my couch before the unfortunate silver Sharpie incident, and it makes me a little sad. Anyone know how to remove Sharpie from faux-suede? I wish I wasn't kidding. i envy you! you are soooo talented! i want to sew. are you making dresses and stuff now?